Air conditioning has been around for well over 100 years, but its use in the automobile didn't really catch on until the late 50s. The reasons are many, but two primary ones were: economic and technical. On the economic side, most Americans lived in non-air conditioned homes and had a hard time justifying installation into their cars. On the technical side, equipment was large, heavy and expensive, and engines tended to overheat in traffic. Six-volt electrical systems weren't up to the task either, so manufacturers weren't too excited about offering air conditioning. Those days are long gone and now you'd be hard pressed to find a new vehicle without factory a/c. We're installing a/c into our classic cars in ever-increasing numbers, so why not learn how these systems work? As far as the science of air conditioning goes, it's simple: if you can remove some of the heat in the air, the result is cooler air. The key to this is that you are removing heat from air. You are not putting cool air into a space. To remove heat you need some equipment, and that's what the a/c system provides. Let's look at this equipment. Every air conditioning system has to have several basic components. These are: the compressor, condensor, evaporator, expansion valve, receiver/dryer, fan, lines and refrigerant. These components work together to remove heat from air and discharge it to the surrounding atmosphere. Refrigerants are materials that are a gas at above-freezing temperatures, but can be compressed into liquid form. As they expand (vaporize) from liquid to gas they can absorb heat. There are over 1,100 known refrigerants, but the most common ones found in automobiles are Freon 12 (before 1993) and Freon 134A (after 1993). Freon is a trademark name for the DuPont company. These refrigerants are known as Chloroflourocarbons. The compressor is an engine-driven machine that draws in gaseous refrigerant and compresses it to a liquid. Compressors are found in many different designs, the most common of which are reciprocal (York), rotary (GM) and radial (GM, others). Whatever the design of the compressor, its function is the same. The condensor is a thin radiator that is placed in front of the cooling system radiator in the vehicle. Air is passed over the condensor coils to take away some portion of the accumulated heat generated by the air conditioning system. The receiver/dryer is a canister placed in the liquid line between the condensor and evaporator. Its purpose is to act as a reservoir for any liquid refrigerant not being immediately used by the system. It contains a dessicant, the purpose of which is to remove any moisture found in the refrigerant. Since the refrigerant contains fluorine and chlorine, any moisture present would create hydrofluoric and hydrochloric acids, either of which would destroy some components. The expansion valve is the point at which the liquid refrigerant is allowed to become gaseous. The rapid expansion of the refrigerant is then used to absorb heat from the conditioned space. Expansion valves can be simple orifices installed in the lines or controlled thermostatically, or controlled by pressure-actuation. Automakers over the years have come up with many different types of expansion valves, but they all do the same thing: regulate the rate at which the refrigerant is released as a gas. The evaporator is a small radiator that carries through its coils the expanded refrigerant vapor. Air is circulated through the coils by a fan and heat in the air is absorbed by the cold coils and transferred to the refrigerant vapor. The lines are high-pressure rubber hoses that connect each of the components together to form a closed, sealed system. The lines are provided in two different internal diameters, the larger to carry vaporized refrigerant and the smaller to carry liquid refrigerant. As the engine turns the compressor its intake valve allows the suction to draw heated refrigerant vapor in. The refrigerant is compressed into liquid form and pushed out of the compressor toward the condensor. Additional heat is absorbed into the liquid as a result of compression. As the refrigerant is moved through the condensor coils the air passing through removes a substantial amount of the accumulated heat from the liquid. The more air passing through, the more heat is removed. 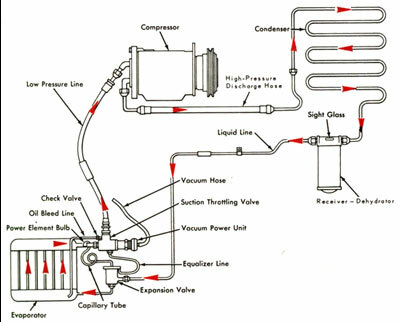 Schematic of refrigeration system. Arrows indicate direction of refrigerant flow. The pressure in the liquid line is typically between 150-250 psi during operation. This is called the high side of the system. The "treated" liquid now moves into the receiver/dryer and remains there until the system calls for it. It then moves to the expansion valve, where it rapidly expands to a gas and becomes super-cooled. The expansion valve releases the vapor directly into the evaporator, where the car's air is circulated through by the blower motor. That warm air loses some of its heat to the evaporator, thus cooling the interior. The refrigerant vapor in the evaporator then travels to the compressor, completing the cycle. The pressure of the vapor is typically between 25-50 psi during operation. This is called the suction, or low side. Virtually any car can be air conditioned as long as there is enough space for the condensor, compressor and evaporator. Cooling systems must be up to the task, however, and it is not uncommon that the radiator be enlarged. Generator-equipped older cars frequently don't have the necessary electrical capacity to handle the 30+ amps required by the compressor and evaporator blower. Generators can be re-wound for greater amperage, however. Another way to go is the installation of an alternator. When R12 was phased out in the early 1990s a myth circulated that changeover of so-equipped systems to R134A would cost many hundreds of dollars. This is nonsense. All that is required to change over a passivated (a system that has run for some time) system is to flush the refrigerant and oil from the components, change the O-rings at line connections, and refill with R134A and compatible oil. How powerful are automotive air conditioners? Most sedans have air conditioning systems that can approach 40,000 BTU (3.3 Tons) in capacity. A typical 3,000 square foot house can easily be cooled by a 36,000 BTU (3 Ton) system. Cars need massive cooling capacity in order to quickly bring down the interior temperatures on hot days (easily 130 degrees F) to comfortable levels (70-75 degrees F) in a few minutes. Houses, on the other hand, only need to handle temperature variations of about 15 degrees.